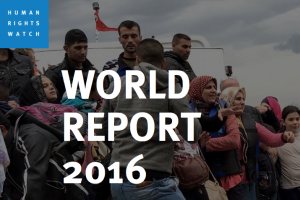 World Report 2016 is Human Rights Watch’s 26th annual review of human rights practices around the globe. It summarizes key human rights issues in more than 90 countries and territories worldwide, drawing on events from the end of 2014 through November 2015. In the introductory essay, “Twin Threats: How the Politics of Fear and the Crush- ing of Civil Society Imperil Global Rights,” Human Rights Watch Executive Director Kenneth Roth details how fear drove two of the most important global developments of 2015. Fears of terror attacks and of the potential impact of refugee influx led to a visible scaling back of rights in Europe and other regions. The New York-based advocacy group’s World Report for 2015 also highlights violent attacks on religious minorities in India, including the September killing of a Muslim man by a Hindu mob who suspected him of slaughtering a cow for food. “The authorities did not press robustly for prosecution of those responsible for violent attacks on minorities, and impunity for the assailants contributed to a sense of government indifference to growing religious intolerance,” the report’s section on India says.